The Tepehuán Indians lived on the rugged eastern slopes and valleys of the Sierra Madre Occidental, primarily in the future state of Durango. They spoke a Uto-Aztecan language and depended mostly on agriculture for their livelihood. Thus, they differed from their neighbors in the deserts to the east, the Chichimeca who were nomadic and semi-nomadic hunter-gatherers. During the Chichimeca war (1550–1590) the Tepehuán remained neutral although urged by the Chichimecas to join them in resistance to Spanish expansion. The Spanish failed to defeat the Chichimeca militarily and instituted a new policy called "peace by purchase" in which Catholic missionaries would be a major tool in pacifying hostile and semi-hostile Indians. Indians were to be supplied with food and tools and resettled into towns. Missionaries, rather than the military, would take on most of the responsibility for integrating the Indians into Mexican and Christian society. The Acaxee and Xixime were the first to have this new Spanish policy applied to them and the Tepehuán would be next. Spanish settlers began coming to the Tepehuan country in the 1570s to mine silver and raise cattle. The Jesuits began missionary work among the Tepehuan in 1596, establishing missions at Santiago Papasquiaro and Santa Catarina de Tepehuanes and, later, El Zape. The Tepehuanes seemed relatively receptive to the missionaries, although they resisted living near the missions and working in Spanish mines and on haciendas, and often raided Indians friendly with Spanish. Nevertheless, by 1615, a Jesuit could declare that the Tepehuanes “showed great progress and were in the things of our holy faith muy ladino" (much like the Spanish). In 1616, however, a messianic leader named Quautlatas who had been baptized as a Christian, arose among the Tepehuán. Quaultlatas traveled throughout the mountains, his symbol a broken cross, preaching that the gods were angry because the Tepehuan had abandoned them and that they must kill or expel all Spaniards, especially the missionaries, from their lands. Quaultlatas’ appeal to his people blended Christian and Indian beliefs. He called himself a bishop and he promised that all those killed by the Spanish would rise again after seven days and that, after the Spanish were killed, the old gods would bless their land with good crops and fat cattle – cattle being a Spanish introduction. Quautlatas' message was typical of the millenarian movements which emerge in societies under extreme stress. Other examples in the Americas and worldwide, include, the Pueblo Revolt, the Ghost Dance, and the Boxer Rebellion. In attempting to explain the cause of the Tepehuán revolt the Jesuits denied any Spanish responsibility. Rather, they saw the Spanish impact as beneficial. “Ever since the Spanish settled here, there has been an abundance of food, clothing, riches, and other material comforts,” said the priest Andres Perez de Ribas. What the Jesuits did not see was the connection in the Indian’s mind between the arrival of the Spanish and death. The Jesuits celebrated the souls saved by deathbed baptisms, but the Tepehuán said that “the fathers had brought them disease and death with baptism, because after they were baptized they fell sick and died.” The Jesuit practice of consolidating the Indians into fewer and larger settlements facilitated the easy spread of disease. in Jesuit eyes the opportunity to live in a town was a characteristic of civilization and was to be encouraged – or forced – upon the Indians. Moreover, the Jesuits worked closely with the Spanish encomenderos and miners to provide them with a steady supply of Indian laborers. As the Spanish perceived that they were providing both earthly and heavenly benefits to the Tepehuán, their explanation was that the revolt was the work of the devil. “It was Satan who intervened here, with a pure scheme and design…This was most clearly demonstrated by the diabolical shamans who had intimate dealings with the Devil and were the main force and instigators of the uprising.” Quautlatas was identified with the Antichrist and the Jesuit's assertion that the revolt was the work of the devil exonerated the Spaniards from blame. On their part, the Tepehuán fought to return to their traditional ways of life, hoping that worshiping their old gods and practicing their old culture would halt the horrific loss of life due to European diseases and their virtual enslavement by the Spanish priests, miners, and encomenderos. one of the greatest outbreaks of disorder, upheaval, and destruction that had been seen in New Spain...since the Conquest. Before it was finished four years later, more than 200 Spaniards, 10 missionaries, an unknown number of Indians, Black slaves, and mestizos allied with the Spanish, and perhaps 4,000 Tepehuán died, many of hunger and disease, with destruction to property valued as much as a million pesos. The Tepehuán attack on the Spaniards, under six war chiefs, most notably Franciso Gogoxito, was well coordinated as nearly simultaneous attacks at missions and Spanish settlements occurred throughout the region. 100 people were killed in a church at El Zape and a similar number died in Santiago Papasquiaro. Only a single Jesuit missionary in Tepehuán territory survived the initial attacks. At the first report of the outbreak, and fearing an attack on Durango itself (Guadiana), Governor Gaspar de Alvear arrested 75 local Indian leaders and ordered them executed. In December he led an expedition traversing Tepehuán country and rescued 400 Spanish and Indian allies. Another expedition consisting of 67 Spanish cavalry and 120 Concho Indian allies set out from Guadalajara in March 1617 and engaged and won several battles with the Tepehuán. In the war against the Tepehuán, the Spanish abandoned their conciliatory "peace by purchase" policy and instead waged a war of "fire and blood" (fuego y sangre). They targeted the six war chiefs and killed the last of them, Gogoxito, in March 1618 during the third major Spanish campaign. After Gogoxito's death major hostilities. Quautlatas was also killed during the Spanish campaigns. However, the death of the war chiefs and Quautlatas did not end the hostilities. Tepehuan continued to raid Spanish settlements and then retreat to the mountains for safety. One Tepehuan raid on Mapimi left about 100 people dead. Despite their initial successes, the Tepehuán were unable to persuade neighboring Indian groups to join their revolt and the Spanish prevailed. In 1618 the missionaries, Jesuits and Franciscans, were allowed to return to their missions. The Governor, however, declared that the province was “destroyed and devastated, almost depopulated of Spaniards. The…churches were burned. The silver mines and their machinery were also burned.” It would be half a century before the region returned to its former prosperity. The Tepehuán Revolt also caused a revision in Spanish policy toward the Indians. Hereafter, the missions and settlements would be better protected by the Army. The revolt was officially declared at an end in 1620 but the Jesuits spent years trying to persuade many of the surviving Tepehuán to come down from the mountains to live at mission stations. They still faced hostility when they attempted to establish a mission among the Tepehuán in 1707 and it was 1745 before a large number of Tepehuán baptisms were reported. Slowly, the Tepehuán were overwhelmed in numbers by Spanish speakers and absorbed into mestizo society. 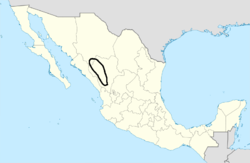 But three groups survived: the northern Tepehuán in Chihuahua and the southeastern and southwestern Tepehuán in southern Durango. They still retain some of their old customs. The northern Tepehuán numbered 6,200 in 2005; the southeastern, 10,600, and the southwestern, 8,700. ^ Philip W. Powell, Soldiers, Indians, and Silver: The Northward Advance of New Spain, 1550-1600, Berkeley: University of California Press 1952. Gradie, Charlotte M. (2000) The Tepehuan Revolt of 1616. Salt Lake City: The University of Utah Press. Riley, Carroll L. & Winters, Howard D. (1963) "The Prehistoric Tepehuan of Northern Mexico." Southwestern Journal of Anthropology, 19(2):177-185. (Summer). This page was last edited on 7 February 2019, at 21:13 (UTC).